I don't live in Williamsburg and as much as I enjoy the Flea and the Smorgasburg, it can be hard for me to get there. Hence I've missed out on all the hubbub around Mighty Quinn's slow barbecued brisket. When chatting with Ed Levine at the Vendys, Mighty Quinn's name came up as Ed's favorite place place for brisket in the city, I knew I had to make the trip to check them out. If their brisket was getting raves from the "Missionary of the Delicious" (and he was even serving it for his own Rosh Hashanah) then I needed in on that. Regular readers know that I very, very, very rarely eat beef. It's just not my thing. But the way Ed described the brisket it sounded so tender, so flavorful, so, so very good that I had to try it. And I was not disappointed. 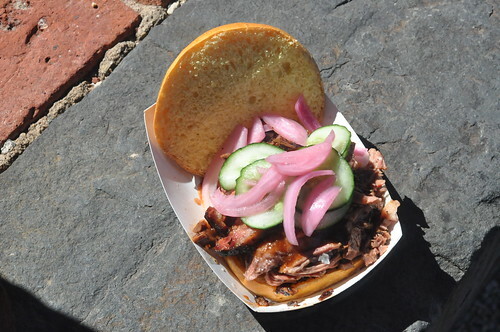 The brisket is sliced to order for sandwiches so it's super moist then piled high on a soft brioche bun. The sandwich is topped with a spicy and sweet sauce, a sprinkling of salt, then finished with pickled onions. It is, in short, one of the most perfect sandwiches I've ever experienced. Every bite leaves you wanting another bite and another. The small is $5, and is really just enough to whet your appetite. Go big ($9) or go home, I say, especially after braving the line which is always the longest of the vendors. Also go early or go hungry. They routinely sell out before the early afternoon. For those of you who don't get out to the Flea or the Smorg, the good news is they're opening a brick and mortar in the late fall. Keep tabs on them via twitter @MightyQuinnsBBQ for updates on locations and openings.